الكرسي رئيس الملائكة ميخائيل و هو واحد من أكثر من الملائكة والقوى غير مادي ، فهو يسمى Archistrategos ، أو القائد ، من غير مادي لكافة القوى. According to Holy Scripture and Tradition , he has interceded for humanity multiple times and continues to serve as the Defender of the Faith. وفقا ل الكتاب المقدس و التقليد ، تدخلت لديه لعدة مرات الإنسانية ، ويستمر لتكون بمثابة المدافع عن الايمان. 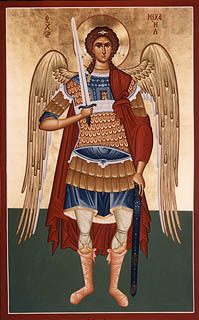 St Michael is most often invoked for protection from invasion by enemies and from civil war, and for the defeat of adversaries on the field of battle. غالبا ما يتم الاستشهاد القديس ميخائيل للحماية من غزو من قبل الاعداء ومن الحرب الأهلية ، وهزيمة خصومها في ميدان المعركة. He is celebrated primarily on November 8 , the Synaxis of Michael and all the Bodiless Powers of Heaven; September 6 also marks the miracle of the Archangel at Colossae. انه هو الذي يحتفل به في المقام الأول على 8 نوفمبر ، و Synaxis مايكل وكل القوى غير مادي من السماء ؛ 6 سبتمبر يصادف أيضا معجزة رئيس الملائكة في كولوسي. The name Michael means "like unto God" or "Who is like unto God?
" اسم مايكل يعني "مثل لله" أو "من هو مثل لله؟"
Michael first appears in the Old Testament in the book of Joshua's account of the fall of Jericho. مايكل تظهر أولا في العهد القديم في سفر يشوع في الحساب لسقوط أريحا. Though Michael is not mentioned by name in the text, it is said that Joshua "looked up and saw a man standing in front of him with a drawn sword in his hand." وإن لم يرد ذكرها بالاسم مايكل في النص ، ويقال إن جوشوا "نظرت الى السماء ورأيت رجلا واقفا أمامه بسيف ضعت في يده." When the still unaware Joshua asks which side of the fight the Archangel is on, Michael responds, "neither...but as commander of the army of the Lord I have now come" (Joshua 5:13-14) 1 . عندما جوشوا علم لا يزال يسأل أي جانب من قتال الملائكة على مايكل يستجيب ، "لا... ولكن كقائد لجيش الرب لدي الآن يأتي" (يشوع 5:13-14) 1 . In the book of Daniel, Michael appears first to help the Archangel Gabriel defeat the Persians (10:13). في كتاب دانيال ، مايكل تظهر أولا لمساعدة الملاك جبرائيل هزيمة الفرس (10:13). In a later vision it is revealed to Daniel that "at that time [the end times] Michael, the great prince who protects your people, will arise. There will be a time of distress such as has not happened from the beginning of nations until then..." في رؤيا في وقت لاحق تبين أن دانيال ان "في ذلك الوقت [أوقات النهاية] مايكل ، الأمير العظيم الذي يحمي الناس ، سوف تنشأ ، وسيكون هناك وقت الشدة مثل هذا لم يحدث منذ بداية الأمم حتى ثم... " (Ch. 12) 1 . (الفصل 12) 1 . Michael thus plays an important role as the protector of Israel and later of his chosen people, the Church . مايكل يلعب دورا هاما باعتباره حامي حمى اسرائيل وبعد ذلك من اختيار الناس له ، و الكنيسة . The Church Fathers also ascribe to Michael the following events: During the Exodus of the Israelites from Egypt he went before them in the form of a pillar of cloud by day and a pillar of fire by night; the power of the great Chief Commander of God was manifest in the annihilation of the 185 thousand soldiers of the Assyrian emperor Sennacherib (4/2 Kings 19:35); also in the smiting of the impious leader Heliodorus (2 Macc. 3: 24-26); and in the protection of the Three Holy Youths: Ananias, Azarias and Misail, thrown into the fiery furnace for their refusal to worship an idol (Dan 3:22-25). و آباء الكنيسة تنسب أيضا إلى الأحداث التالية مايكل : أثناء خروج بني إسرائيل من مصر ذهب معروض في شكل عمود سحاب نهارا وعمود النار ليلا ، وسلطة القائد الله العظيم ظهر في إبادة الجنود 185000 من سنحاريب الآشوري الامبراطور (4 / 2 ملوك 19:35) ؛ أيضا في يضربون من Heliodorus زعيم اثيم (2 تنسيق مكافحة الألغام 3 : 24-26) ، وفي حماية الكرسي ثلاثة شبان : حنانيا ، وازارياس Misail ، ألقيت في الفرن الناري عن رفضهم لعبادة صنم (دان 3:22-25). Through the will of God, the Chief Commander Michael transported the Prophet Habbakuk (December 2) from Judea to Babylon, to give food to Daniel in the lions' den (Dan. 14:33-37). من خلال إرادة الله ، ونقل القائد مايكل Habbakuk النبي (2 ديسمبر) من يهودا الى بابل ، لإعطاء الطعام لدانيال في عرين الاسود '(dan. 14:33-37). The Archangel Michael disputed with the devil over the body of the holy Prophet Moses (Jude 1:9). المتنازع عليها رئيس الملائكة ميخائيل مع الشيطان على جثمان موسى النبي الكريم (يهوذا 1:9). In New Testament times, the holy Archangel Michael showed his power when he miraculously saved a young man, cast into the sea by robbers with a stone about his neck on the shores of Mt Athos. في العهد الجديد مرات ، المقدسة رئيس الملائكة ميخائيل وأظهر قوته عندما أنقذ بأعجوبة شابا ، يلقى في البحر على يد لصوص بحجر حول رقبته على شواطئ جبل آثوس. This story is found in the Athonite Paterikon, and in the Life of St Neophytus of Docheiariou (November 9). وجدت هذه القصة في Paterikon Athonite ، وفي حياة القديس Neophytus Docheiariou (9 نوفمبر). Perhaps his most famous miracle, though, is the salvation of the church at Colossae. ربما معجزة عبارته الشهيرة ، رغم ذلك ، هو الخلاص من الكنيسة في كولوسي. Here a number of pagans tried to destroy this church by diverting the flow of two rivers directly into its path. هنا حاول عدد من الوثنيين لتدمير هذه الكنيسة من خلال تحويل تدفق نهرين مباشرة في المسار الخاص به. However, the Archangel appeared amongst the waters, and, carrying a cross, channeled the rivers underground so that the ground the church stood on would not be destroyed. ومع ذلك ، يبدو أن رئيس الملائكة بين المياه ، ويحمل الصليب ، توجه أنهار تحت الارض حتى أن الأرض لن الكنيسة وقفت على تدميرها. The spring which came forth after this event is said to have special healing powers. الربيع الذي جاء بعد عليها ويقال إن هذا الحدث لقوى الشفاء الخاصة. Michael also has been associated with healing in other cases, as well as his primary role as leader of the Church Militant. مايكل أيضا ارتبط الشفاء في حالات أخرى ، فضلا عن دوره الأساسي كزعيم للكنيسة متشددة. said to appear to Emperor Constantine the Great (d. 337) at Constantinople, to have intervened in assorted battles, and appeared, sword in hand, over the mausoleum of Hadrian, in apparent answer to the prayers of Pope St. Gregory I the Great (r. 590-604) that a plague in Rome should cease. وقال انه تم لتظهر إلى الامبراطور قسطنطين الكبير (ت 337) في القسطنطينية ، قد تدخلت في معارك متنوعة ، وبدا ، والسيف في يده ، على ضريح هادريان ، في الإجابة على ما يبدو لصلوات البابا القديس غريغوريوس الأول الكبير (حكم 590-604) أن الطاعون في روما يجب أن تتوقف. Russians in particular have a special veneration to Michael, along with the Theotokos . الروس على وجه الخصوص لها التبجيل الخاص لمايكل ، جنبا إلى جنب مع والدة الإله . "Intercession for Russian cities by the Most Holy Queen of Heaven always involved Her appearances with the Heavenly Hosts, under the leadership of the Archangel Michael. Grateful Rus acclaimed the Most Pure Mother of God and the Archangel Michael in church hymns. Many monasteries, cathedrals, court and merchant churches are dedicated to the Chief Commander Michael. 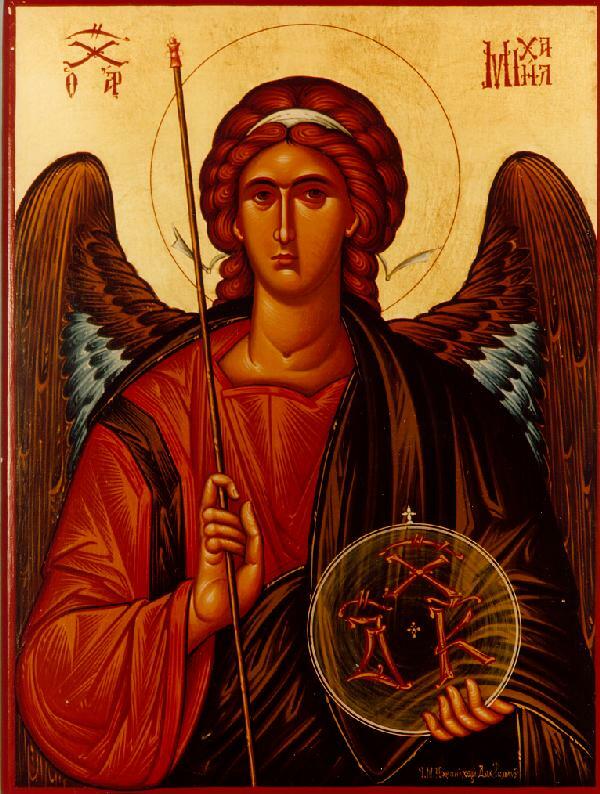 In Rus there was not a city where there was not a church or chapel dedicated to the Archangel Michael." وفقا لل المجلس الاولمبي الاسيوي "الشفاعة ، عن المدن الروسية من قبل الملكة المقدسة معظم السماء تشارك دائما ظهورها مع المضيفين السماوية ، تحت قيادة رئيس الملائكة ميخائيل. بالامتنان روس المشهود أزكى والدة الله ورئيس الملائكة ميخائيل في تراتيل الكنيسة. العديد من الأديرة والكاتدرائيات ، وتكرس المحكمة والتاجر الكنائس إلى مايكل القائد ، وفي روس لم يكن هناك المدينة حيث لم تكن هناك كنيسة أو معبد مكرس لرئيس الملائكة ميخائيل. " There are three icons of the Archangel Michael that he has personally intervened miraculously to the "authoring" of his image; Mantamados , Panormitis and Nenita . هناك ثلاثة رموز رئيس الملائكة ميخائيل أن تدخلت شخصيا وبأعجوبة إلى "تأليف" من صورته ؛ Mantamados ، Panormitis و Nenita . Each of these icons are different. كل من هذه الرموز مختلفة. More typically, he is represented as the Chief Commander of the Heavenly hosts, where he holds a sword in one hand; in the other he often carries either a shield, a date-tree branch, a spear, or a white banner (possibly with a scarlet cross). أكثر عادة ، وهو ما يمثل قائد كبير من المضيفين السماوية ، حيث كان يحمل السيف في يد واحدة ، وفي الآخر يحمل في كثير من الأحيان إما درعا ، وهو فرع شجرة الميلاد ، والرمح ، أو لافتة بيضاء (ربما مع عبر القرمزي). Michael is also represented in icons as standing on a horizontal body and with his left arm held high, holding a small image of a "baby". كما يتمثل في مايكل الايقونات كما يقف على الجسم مع الأفقي وذراعه اليسرى مرفوعة ، وعقد على صورة صغيرة من "بيبي". the image of the "baby" represents the soul of the deceased. الجسم يمثل إنسان في وقت وفاته وصورة "بيبي" يمثل روح الفقيد. This icon came about since the belief has always been held that the Archangel Michael takes the souls of the dead with the Guardian Angel. وجاء هذا الرمز منذ حوالي ارتبط دوما اعتقاد بأن رئيس الملائكة ميخائيل يأخذ أرواح الموتى مع الملاك الحارس. This is typical of the miraculous and wonder-working Panormitis icon in Symi of Greece. هذا هو الوضع الطبيعي للمعجزة واتساءل العاملة Panormitis الرمز في سيمي اليونان. In Russian iconography he is most likely to be wearing red. في الايقونية الروسي انه من المرجح أن يكون ارتداء الأحمر. In many instances, Michael tramples the devil under his feet, which may be depicted as a dragon. في كثير من الحالات ، يدوس مايكل الشيطان تحت قدميه ، والذي قد يكون كما هو مبين التنين. This comes from the tradition that Michael was the main opponent of Satan in the battle for Heaven. ويأتي هذا التقليد من أن مايكل كان الخصم الرئيسي للشيطان في معركة السماء. Satan, previously called Samael, was always looking to discredit Israel, while Michael was its main protector. كان من الشيطان ، دعا في وقت سابق سمائل ، وتبحث دائما لتشويه سمعة إسرائيل ، في حين كان مايكل الحامي الرئيسي. In the end, Satan attempted to drag Michael down in his fall from the heights, but Michael was rescued by God. في النهاية ، حاول الشيطان لسحب مايكل عليها في سقوطه من مرتفعات ، ولكن تم انقاذهم من قبل مايكل الله. There is only one 'icon' in the Orthodox church tradition that defies the traditional structure of iconography. هناك واحد فقط 'رمز' في تقليد الكنيسة الأرثوذكسية أن يتحدى الهيكل التقليدي للالايقونية. of Mantamados that exists in Mytilene, Lesvos. هذا هو رمز من Mantamados موجود في ميتيلين ، يسفوس. Here his upper-torso is represented as a three-dimensional image mixed with dirt and blood of martyrs and he is a warrior. هنا يتم تمثيل له الجذع العلوي كصورة ثلاثية الابعاد مختلطة مع الأوساخ والدم والشهداء وهو المحارب. كان إنسانا مسكينا أميا لا يعرف شيئا من الكتب المقدسة اسمه اتركنطيس , وكان ينظر الهدايا والتحف والذهب والفضة والحرير والنذور التى يقدمها الناس إلى بيعة رئيس الملائكة ميخائيل , وأن الشيطان العدو للخير ملأ قلبه فإفتكر وقال هكذا أقوم وأمضى فأدخل البيعة التى لرئيس الملائكة ميخائيل وأسرق منها الأوانى وأمضى إلى مدينة بعيدة لا يعرفنى فيها أحد وأبيعها وأخذ منها وأغتنى به دون أن يدرى أحد بذلك فهناك كثيرون مثلى يأكلون من خيرات ميخائيل أما هو فلا يأكل ولا يشرب , وأن هذا الإنسان الجاهل قام لوقته ومضى واختفى فى المدينة ستة أشهر لم يظهر فيها لأحد من الناس ولم تعلم زوجته بأفكاره هذه وبعدها مضى إلى الكنيسة التى لرئيس الملائكة وهو فى صفة رجل غريب وانتظر حتى ساعة متأخرة من الليل ودخل الهيكل المقدس وقد نسى العجائب العظيمة التى لرئيس الملائكة ميخائيل ففتش وعثر على صليب ذهب وسترين ديباج (حرير خالص) وسرقهم ولم يعلم به أحد , ودخل بيته فقالت له إمرأته من أين جئت بعد هذه الفترة الطويلة فقال لها بمكر لقد سافرت وها قد حضرت فقالت هل ربحت شيئا فى تلك الغيبة قال لها أيتها الإمرأة قد وجدت تاجرا موسرا بالمال فأعطانى بضاعة أتاجر فيها ثم أعطيه نصيبه من الفائدة فقالت له لعل الله سبحانه ورئيس الملائكة ميخائيل قد سبب لنا رزقا لنعيش به باقية حياتنا ,وأنه لم يريها إياها بل دخل على داخل بيته وحفر فى الأرض ودفن الصليب والستور فى مكان لا يعرفه أحد وبعد أيام قليله مضى كعادته وسرق أيضا من البيعة كأس ذهب ذات ثمن كثير ,وهكذا مضى ثالثة وعمل كعادته الرديئة وأخفى الجميع , ولا يدرك إنسان ما أن هناك من تجاسر على سرقة بيعة الله لأن النذور كانت كثيرة من الذهب والفضة والستور التى لا عدد لها , وأن الرب أطال روحه وأناته على ذلك الشرير لأنه كان ينتظر توبته لأنه لا يشاء هلاك أحد ما . وأنه بعد زمان أتى إلى المدينة تاجر يهودى ليشترى بضاعة وكان معه مالا كثيرا وأن الشرير أتركنطيس دعا ذلك التاجر وأحضر له تلك الآنية فأعجبته وقال له أعطيك ثمنا للسترين ألف دينار والصليب خمسمائة دينار والكأس عشرة ألاف دينار ولكن تحفظ السر حتى أسافر , وأن ذلك الرجل أخذ الذهب وأعطاه الآنية , فذهب اليهودى لوقته وخبأهم فى صندوق فضة فى مركبه وعجل بالسفر لأنه كان يعلم أن ذلك الثمن أقل بكثير ولا يساوى ثلث الثمن , ففى نصف الليل أمر الملاحون أن يسافروا لكنهم بذلوا كل جهدهم ولم يستطيعوا أن يحركوا المركب , وأقاموا على ذلك الحال ثلاثة أيام لأن رئيس الملائكة ميخائيل أعاقهم عن السفر . ففكر اليهودى فى نفسه قائلا إن جميع ذلك إنما حل علينا بسبب الأوانى التى اشتريتها دون قيمتها فقام وجاء إلى المدينة وتكلم مع ذلك الرجل الذى باع له الأوانى قائلا إننى منذ صغر وحتى الآن لم تصبنى شدة مثل هذه فإن كان فى تلك الأوانى شك ما فخذها الآن لأنها لا تكون من نصيبى , لكن الشيطان ملأ قلب اتركنطيس فقال للتاجر أنا لا أعرف كثرة الكلام إمضى من هنا أيها الغريب واخرج من هذه المدينة وإلا قتلتك . فلما سمع التاجر اليهودى هذا الكلام علم أنه رجل مكّار فمضى لوقته إلى والى المدينة وعرّفه حكايته كلها وما جرى له , وأن الوالى تعجب لهذا الأمر وأرسل وأحضره , ومضوا إلى مركب ذلك التاجر ومعه أراخنة المدينة كلها ونظر إلى الأوانى المقدسة فعرفها وعلم انه تخص بيعة رئيس الملائكة ميخائيل وهو الذى أعاق المركب من السفر وأمر الوالى بإحضارى أنا الحقير ديوناسيوس حتى يعرفوا حقيقة الأمر فتعجبت لذلك جدا وأرسلت قيم البيعة التى رئيس الملائكة وسألته عن الأوانى فوجدها قد سرقت دون علمه وأن الوالى وضع ذلك الرجل اللص فى السجن فمضيت إليه وحدثنى بما جرى وأنه نذر نذرا إن خلص من السجن سالما , وأخذنا الذهب الذى أخذه وأعطيناه لذلك التاجر اليهودى ثم أخذنا الأوانى المقدسة وكل ما سرقه وأحضرنا الجميع إلى البيعة المقدسة وأطلقنا الرجل من الحبس , وبعد ذلك مباشرة تحركت المركب وأقلعوا إلى مدينتهم بسلام . فأى لسان جسدانى يقدر أن يصف كرامات وعجائب رئيس الملائكة الجليل ميخائيل فهو الذى يسأل عن ثمار الأرض ولبشر والبهائم ويسأل عن إعتدال الأهوية ومياه النهر ليصعدها الرب كمقدارها . رئيس الملائكة ميخائيل هو الذى يشفع فى جنس البشرية جميعها , فنطلب كلنا أن يشفع فينا لنجد رحمة ونياحا أبديا فى ملكوت السموات .